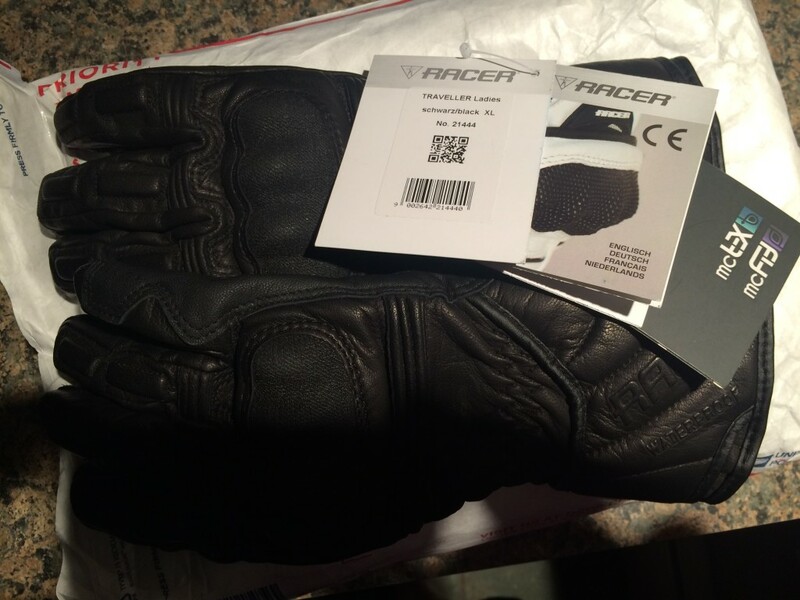 I gave Sean MacDonald over at Lanesplitter a bunch of crap after he went all gooey on a pair of gloves from Racer, an Austrian brand with distribution in the US. He challenged me to actually try the gloves, so I did. After a few emails with the distributor in the US, a great guy named Lee, I ordered a few pair of gloves to try out. The problem is that I have stupidly long fingers. Not long in the normal sense that I would need size Large gloves, but stupidly long in the sense that I actually only own one pair of glove that really fits, and they were off a clearance rack of gloves that no one else fit into. Length-wise, a men’s 10 or 10.5 is usually the trick. Of course, then I end up with a super wide glove with really bulky fingers. It’s not a good thing, and I generally accept stuffing my fingers into a 9 and hoping I can take breaks. The gloves from the clearance rack are summer gloves and at first, I thought they were too big. Then I rode with them. Huge revelation. Before that, I’d never worn gloves that fit properly. You know how they say to buy gear you’ll wear? Day after day, I kept putting those $14.99 clearance-rack Speed and Strength gloves on. Ugly, dorky, but damn do they actually fit. The Racer Traveller DXL (ladies extra large) gloves actually fit pretty well, too. They are bigger in the palm than I need, but not nearly to the extent a men’s glove is, and are long enough that my fingers and thumbs don’t get jammed up. It’s also not a summer glove. Not a proper winter one, but better than any other glove I have that fits when it comes to weather. It’s waterproof and the lining is soft. It has hard knuckle protection, also a step up from anything else I own (that fits). The whole fit thing is a huge issue – joint pain is nothing to mess with and jamming your fingers can lead to cartilage damage. I don’t want to go there. I’ll be riding with them tomorrow and beyond. I’m pretty stoked. A quick peek at using the lane splitting (or lane sharing) technique to avoid an emergency braking situation and all of the risk it entails. It’s important to look for the extra space that can open up. Every survival reaction begins with the reduction in visual room, per Keith Code. Looking ahead and seeing the space open up means better, smoother reactions, and more safety. Always. It was time to buy a second car – we’d both scored good jobs in opposite directions from the house, and one car wasn’t going to work. The old Integra was still running great. I was sure I’d wiped all of those dirty EU thoughts out of my spouse’s head, but he wanted a Golf. Ok, Golf it was. We must have test drove fifteen of them. It was the third generation Golf, not really the high point of the Golf franchise, so I was really disappointed. Soggy suspension, flat seats, plastic everywhere. And that autotragic. Yuck. Every single one of them was a disappointment. Then, one day, we drove a dark green five-door. It was different. Side note: There was a Nugget Yellow G60 on the lot, too. I was actually in love, but was pretty confident that it would mean the end of my marriage. I didn’t even know anything about G60s back then. Ah, I still dream about that thing….. Black leather interior…. 5MT…. But I digress. The green five-door was stiffer. It was quicker off the line. The autotragic was less tragic and almost magic. It was super close ratio, very odd in the US. Everything about the car was far closer to what I expected from Volkswagen than any of the other Golfs we drove. Ok, I’ll accept it. But I hemmed and hawed about that yellow G60…. And signed on the Golf. It was easy to speak well of the car. It delivered like my ’88 Integra did. Everything worked, and what didn’t was repaired or replaced by the dealer. All was well. About a year into ownership, we got the dreaded red envelope in the mail. The first of two, actually. It mentioned that the transmission in the car was not intended for the US market, instead it was a Swiss market transmission. For mountain climbing. Well, we lived on a small mountain in Philly, so no wonder we liked it. We didn’t have to exchange it, but if we wanted to, the dealer would put in the proper US-spec transmission and we would get better mileage. I laughed, because now I knew for sure that we had a close-ratio automatic as I suspected. It was a substantial upgrade over the normal 4sp box. A few weeks later, we got the second red envelope, this one with a bit more forceful language in it: the engine was recalled. We were to take it back to the dealer for a new motor. The one we had might not pass US emissions testing, and VW could not guarantee the emission system would work in accordance with US laws. We would only get the full emissions system guarantee if we had the engine replaced, and they would do the entire powertrain for us to be safe. If for any reason, the emissions failed testing at a dealership, the car would have to have the entire powertrain replaced with a US-legal unit at no charge. That letter went into the same file. I learned that at that time, EPA could not force us to do a darn thing. Only safety recalls could be enforced. The suspension that did not conform to whatever the FMVSS for suspension is was not recalled, although it probably should have been. It took me several years to ferret out exactly what had happened with the car. It wasn’t until we started hearing the same line from the dealer during service visits: “Sorry Mrs H, but we have to air-freight parts from Germany. Your part numbers aren’t in the US system.” It finally clicked. I queried the parts counter and discovered the parts were indeed Swiss market. What else is wrong with this thing? Back in the day before VW figured out that the Toyota Production System (TPS or Just-in-Time) really did work, they built cars at Puebla using the campaign model. This was the standard since the time of Henry Ford, so it’s hardly that bad of a model. It’s very efficient. Four hundred cars for the US market in silver with black interiors and 4-speed automatics mated to 2.sl0s. One hundred cars for the German market in Tornado Red with beige interiors and 5MTs mated to 1.8s. And so on. We caught a campaign-switch car, where a few powertrains and running gear assemblies were leftover from a Swiss campaign. This happens when a body is too damaged for use, the paint is bad, any number of problems that force the body off the line after the VIN is stamped on. They were mistakenly married to bodies with VINs designated for US delivery, which got proper US interiors during final assembly, making the problem nearly impossible to spot. This offset affected less than ten cars – I believe about four total. When the transmission eventually failed (a VW thing), our good relationship with the dealer service and parts team paid off – they were able to source and obtain the exact same transmission. Of course, it took a week to air-freight it from Germany, but who’s counting? We eventually traded the car in on our first TDI, which has its own interesting tales, too. We did not discuss the outstanding emissions recall. And that’s the story of the other EPA non-compliant Volkswagen we owned.